Hello lovelies, the boys have absolutely adored this new toy set they received from Schleich! My boys are massively into dinosaurs so they were over the moon to get this awesome package. 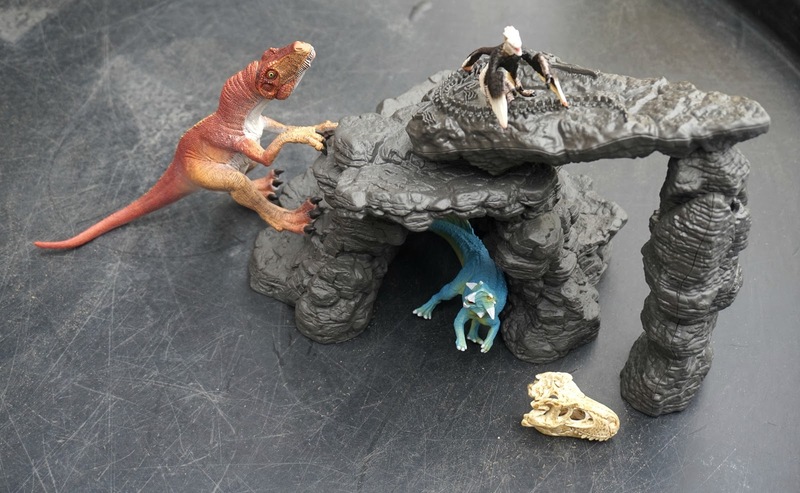 This is what it looks like when you open the box and everything that comes inside, you get the cave which is very easy to assemble, three dinosaurs and a dinosaurs skull. 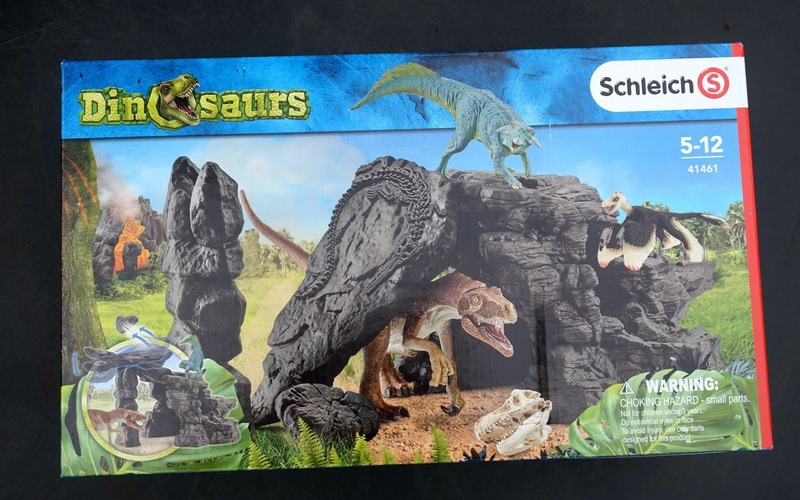 Schleich toys are very well built and made to last, we have toys from years ago from Schleich and they are still going strong. Well needed with two heavy handed boys may I add. 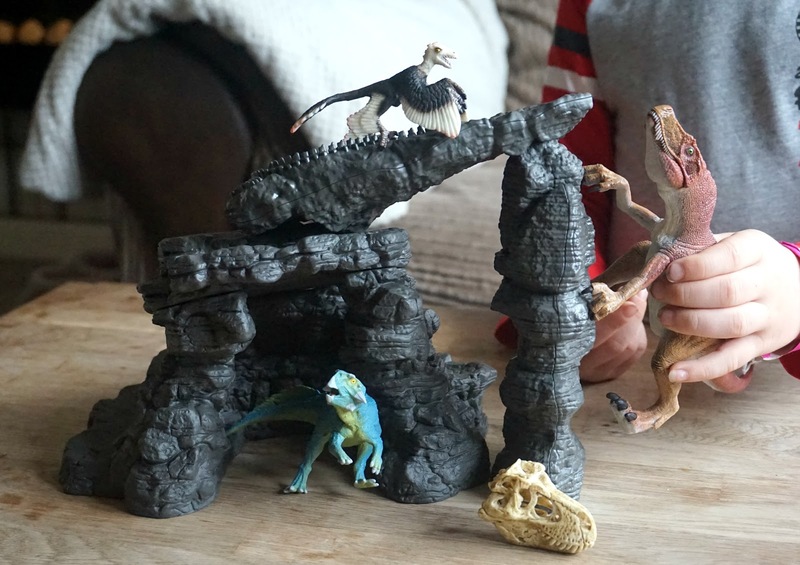 We set up the cave together and they boys had hours of fun together, we used the slime from my previous post and turned that into 'lava' so they boys had great role play with the toys and acted like they imagined how it would of been in dino times. 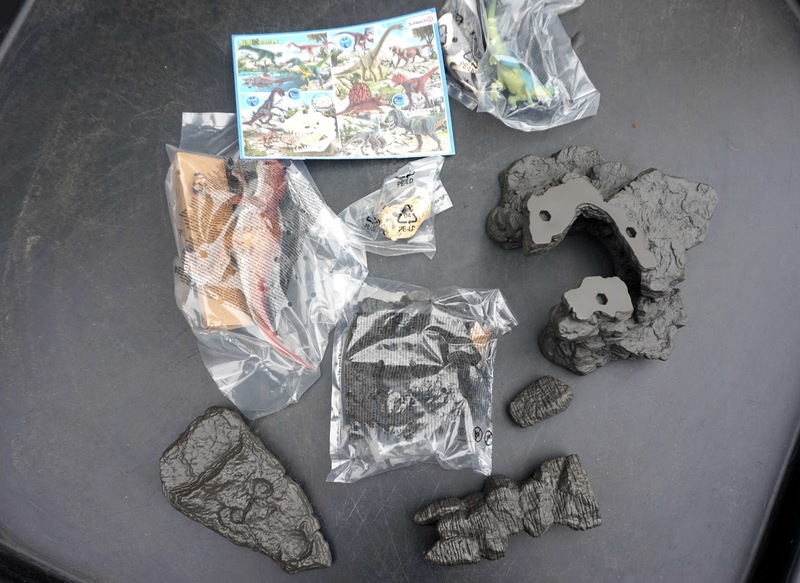 You could get this set out and make your own dinosaur town/garden with twigs, leaves or indoors with different coloured paper and make out your own scene for the children to enjoy. The front part of the cave can be turned into a catapult when the stone column is removed! Oscar was talking to Lawson about all the types of dinosaurs he knew and Lawson just shouted roar and tried to eat the other dinosaurs. I think it is a very high price tag but for how many years play you will get out of it it is worth it, when you buy cheaper toys they don't last as long as us parents know, the paintwork chips very easily as the paintwork on these toys are very detailed and last longer sometimes its worth paying that bit extra to have toys that last plus do children ever get sick of dinosaurs? Its great to keep them around when they are learning about these topics in school. You can play whilst you learn and its great for eye ad hand coordination for Lawson, although the toy is aimed at 5 plus due to smaller parts as long as you are watching your younger ones they will be fine and wouldn't want to miss out on all the fun! The stone slab buries everything underneath it and the dinosaur Herrerasaurus comes with a moving jaw so very realistic when catching his prey. This would make a child very happy this christmas or for their birthday as it would be a special gift considering the price tag or for a very good treat.